The spectacularly fast-whirling dead stars known as millisecond pulsars put the brakes on their spinning in large part by blasting pieces of themselves into space, a new model suggests. Pulsars are the super-dense, strongly magnetized cores of massive stars left behind after they go supernova. Specifically, pulsars are neutron stars made of densely packed neutrons, with each sugar cube-size piece of neutron star matter weighing as much as a mountain of about 100 million tons. These neutron stars can bulk up on matter and energy by cannibalizing companion stars, a process that makes the pulsars give off X-rays and spin extraordinarily fast — at rates of 100 to 1,000 turns each second — earning them the moniker "millisecond pulsars." Later, after siphoning all the matter in the outer envelopes of their companion stars, millisecond pulsars gradually slow down and emit radio waves instead. However, little was known about what happens during the actual slowdown before these pulsars start blasting radio waves. A new study by astrophysicist Thomas Tauris at the University of Bonn in Germany may have the answer. Tauris found that millisecond pulsars can hit the brakes dramatically. In the end stages, the dead stars can lose more than half their rotational energy, the study found. 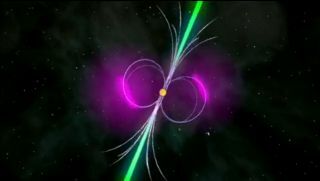 Computer models suggest that the magnetospheres, or shells of charged particles around millisecond pulsars, grow as their companion stars shrink. This growth exerts a braking torque on the pulsars. In addition, when matter from the companion stars enters these magnetospheres, it can get blasted away instead of glomming onto the pulsars, which also helps slow the pulsar's spinning. "Now we know that the very same process responsible for spinning up old neutron stars to extraordinary fast spin rates with periods of 1 to 10 milliseconds is actually also causing the millisecond pulsars to spin down again," Tauris said. The findings appear to agree with the latest observations. "An important implication of this work is that the X-ray-emitting millisecond pulsars, which are still accreting material from their companion star, should, on average, spin faster than the millisecond pulsars emitting radio waves," Tauris added. "This is exactly what the current observational data seems to suggest." Tauris detailed his findings in the Feb. 3 issue of the journal Science.